Larnach Castle and Gardens is open 365 days of the year. 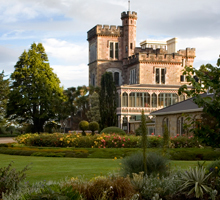 Larnach Castle offers a range of ticketing options for entry to the Castle and Gardens. Larnach Castle is open 365 days of the year. Discover more about the special guided tours of Larnach Castle and Gardens. Larnach Castle is pleased to offer an audio/visual tour guide to accompany your visit to the Castle and Gardens. The Ballroom Cafe can cater for all size groups, from a couple wanting an elegant High Tea, to a larger group celebrating a birthday. The gardens, grounds and ballroom cafe are accessible to all visitors. However, the Castle includes several stairways. High Tea at Larnach Castle is available at 3:00pm Daily. Bookings are required 24 hrs in advance. Special offers for entry to Larnach Castle and Gardens.